When we think about Eileen Caddy there is so much wisdom flowing forth from her inner voice/listening. For instance: ‘Never try to look too far ahead; that in itself can cause great strain and distress. You can only take one step at a time, so take that one step, and the next will follow at exactly the right time. Let things unfold, and do not try to manipulate them.’ It is no surprise that when Findhorn assembled a book celebrating the life and work of Eileen they called it ‘Divinely Ordinary, Divinely Human’. 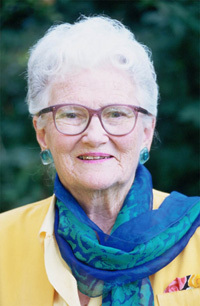 Eileen Jessop was born in Alexandria, Egypt, that ancient seat of spiritual learning. In 1939 she married Andrew Coombe who was a member of Moral Rearmament, an obscure shadowy group, who nevertheless held quiet meetings when a group would sit together and listen for divine guidance. After fourteen years of marriage Eileen fell in love with Peter Caddy and after first hearing an ‘inner voice’, a voice inside her head, she and Peter moved to Scotland where they ran the Cluny Hill Hotel in Forres. For a while Sheena Govan was her spiritual teacher before Sheena faded from their lives after a testing time for Eileen living on Mull. In 1962, with Dorothy Maclean now on board, they parked their small caravan in a corner of the Findhorn Bay Caravan Park and despite the hard and cramped living conditions Eileen kept to her meditation practice for several hours each day with a written record of all the messages she was receiving. For three years they were quite contained but by 1965 visitors started arriving and the community grew. She was able to give guidance to Peter and the community in those formative years until in 1971 she was told to stop so that each person could learn to ‘go within.’ This included not giving guidance to Peter which up to that point had been essential to his life at Findhorn. Now, after 30,000 pages of guidance Eileen was to become an inspirational figure in the new age movement with her books of prayer, meditations and aphorisms selling in their thousands. She separated from Peter in 1978 but remained living at Findhorn until her death in 2006. She had spiritual contact with Sir George Trevelyan and Ronald Heaver that was important to both men. Her ‘messages’ were published originally under her spiritual name of Elixir under the title ‘God’s Word’. They often ended: ‘Let My peace and love infill and enfold each one of you. Lift up your hearts in deep love, praise and gratitude for all I am revealing to you, and do something about it. Be at perfect peace as you do My will and walk in My ways, glorifying Me. Praise be.